The Memorial and Library Association of Westerly was established in 1892 to commemorate the volunteer soldiers and sailors who fought in the Civil War. 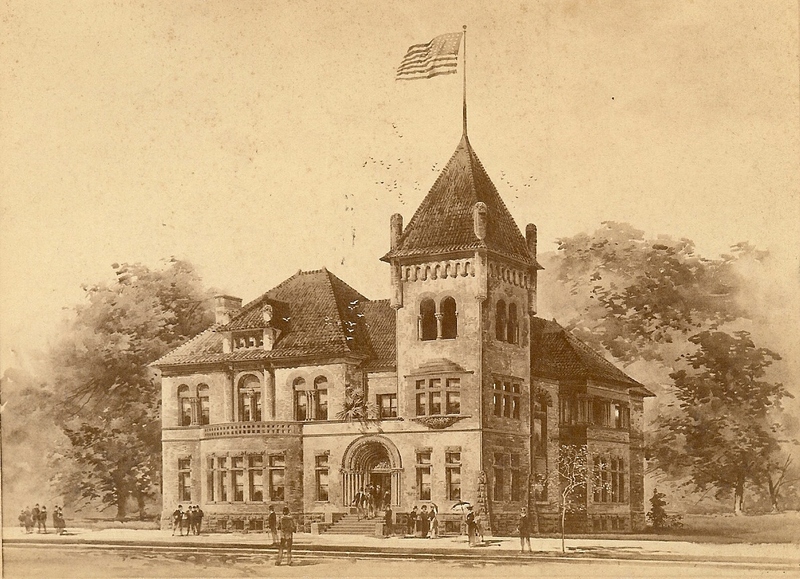 Designed by Longstaff & Hurd, architects from Bridgeport, Connecticut, Westerly Public Library opened its doors in 1894 through the initiative of local industrialist-inventor, Stephen Wilcox. Mr. Wilcox donated the land on which the library is situated, as well as $25,000 to be matched by citizens of the community. Originally the library included a bowling alley, gymnasium, art gallery, museum, and meeting space for the Grand Army of the Republic. On opening day, August 15, 1894, Westerly Public Library had a collection of 5,000 volumes, and the building was open 24 hours each week. Additions were constructed in 1902, 1928 and 1992. A major interior renovation in 2010 integrated the four spaces and made them flexible for future needs of the community. The library’s first addition in 1902, contained a beautiful art gallery to house the Wilcox’s art treasures. The second edition, constructed in 1928 contained a new Children’s room with an Art Gallery above and museum below. The Hoxie Gallery is currently one of the premier galleries in the region. The changing exhibits feature the work of local artists and cooperative groups. The final addition, which won the 1994 Historic Preservation Award from the Rhode Island Preservation Commission, nearly doubled the size of the building. By 1998 the Library began to experience a “space crisis” trying to accommodate the growing collection of audio visual materials, increased programming, and computers. Today, the Library is open 60 hours each week, and the collection includes books, magazines, CDs, and DVDs, and more totaling more than 183,000 items. There are computers for public use throughout the building including a newly renovated computer lab and Makerspace. The Library, a participant in a statewide-automated network, offers its members access to online databases, e-books, and several million items from library collections across the State of Rhode Island. Not part of municipal government, the Memorial and Library Association of Westerly is a private, not-for-profit Corporation, which receives roughly 25% of its total annual budget from the towns of Westerly, Rhode Island and Stonington, Connecticut and depends upon its endowment, grants and community support for the rest. The mission of the Memorial and Library Association is to strengthen the community and enrich lives by stimulating intellect and sparking imagination through access to literature, information, nature, and the arts. Westerly Library and Wilcox Park strives to be one of the premiere intellectual, cultural, and botanical assets in the region.